A podiatrist, also called a doctor of podiatric medicine, is a specialist who provides medical diagnosis and treatment of foot and ankle problems, such as bunions, heel pain, spurs, hammertoes, neuromas, ingrown toenails, warts, corns and calluses. 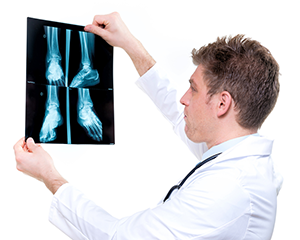 A podiatrist also renders care of sprains, fractures, infections, and injuries of the foot, ankle and heel. In addition to undergraduate medical school training, podiatrists also attend graduate school for a doctorate degree in podiatry. Podiatrists are required to take state and national exams, as well as be licensed by the state in which they practice. For more information about making an appointment with one of our Podiatrists, call Regional Foot and Ankle Specialists, LLC serving the Pennsauken & Turnersville, NJ area!